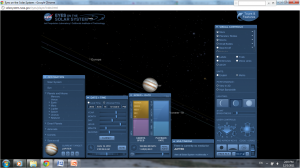 There are a number of useful observing tools online. For instance, today I used Sky and Telescope’s Transit Times of Jupiter’s Great Red Spot to plan this evening’s observation session. 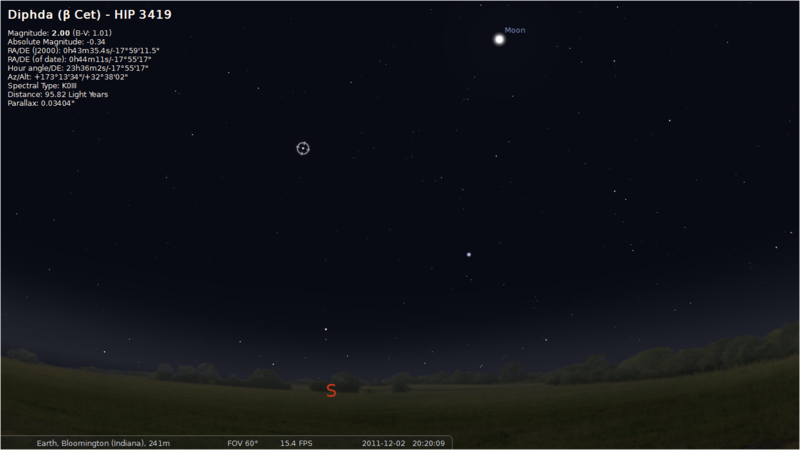 I regularly use Stellarium, a free open source virtual planetarium, to look at the night sky. Similarly, I try to look at Heavens Above at some point during the day so I know when to run outside and look for an interesting satellite flyby. I follow the International Space Station on twitter (@twisst); once a day I get a tweet telling me when and where to look to see the ISS flyover. So far today, I’ve used Sky and Telescope’s This Week’s Sky at a Glance, the Red Spot calculator, Stellarium, and two iPhone apps (Moon and Moon Globe, both free). I also used Mars Globe, but just because I was goofing off—I like to know when daylight strikes Gale Crater, for some reason. And speaking of goofing off, if you’ve got some time on your hands, I’ve got the website for you. Before last Saturday’s Mars Science Laboratory launch, attendees of the MSL NASATweetup had the opportunity to attend a demonstration of Eyes on the Solar System, JPL’s 2D/3D visualization tool. Populated with NASA mission data, Eyes on the Solar System allows the user to soar and leap through the universe in real time (you’re not limited to real time, though). I’ll be honest: the learning curve is a bit steep, but once you get the hang of the controls, you’ll find yourself zooming from planet to planet, satellite to asteroid. 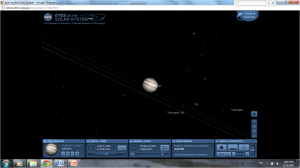 You’ll be playing god, commanding the moons of Jupiter to orbit in double time or more. I’ve currently got them moving at approximately 170, 700, 000 miles per hour, which means I’m forcing them to fly across the distance they would normally travel in 1 hour in the space of a second. The above screen shot (click on the image to enlarge it in a new window) gives you an idea of the user interface. If you look at the bottom center of the screen, you can see that I’ve sped up the speed of the orbits (170, 065, 241 MPH at the moment I took the screen shot). To the right of that speed designation is a button for re-setting the motion to real time. 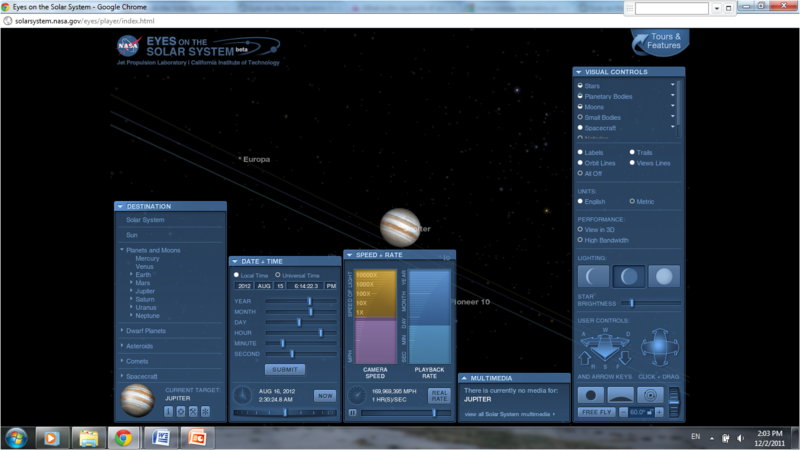 Above is a screen shot with all the menus open. You can see some of the pre-set tour options in the left-hand fly-up menu. 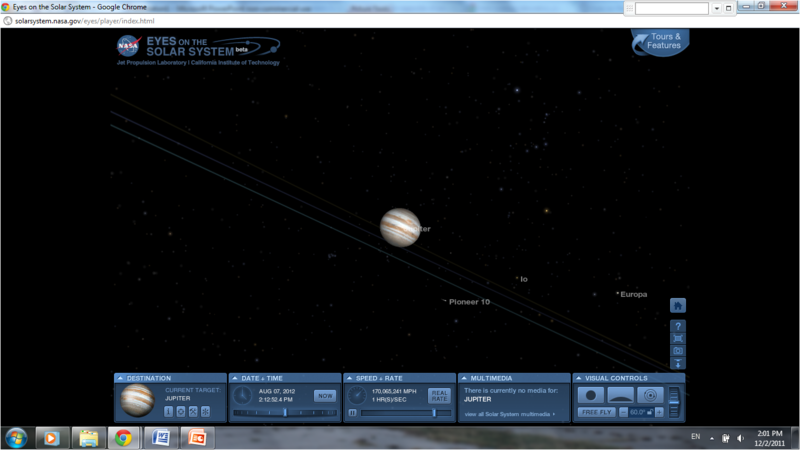 You can zoom in and study the sun, any of the planets, including the dwarfs, asteroids and comets. But maybe the most exciting option is riding along with some of NASA’s spacecraft. You can configure the program to look over the spacecraft’s “shoulder” or use the SPEED + RATE menu to look ahead in the spacecraft’s predicted trajectory. I’m super happy to say that Mars Science Laboratory data is already being folded into Eyes. 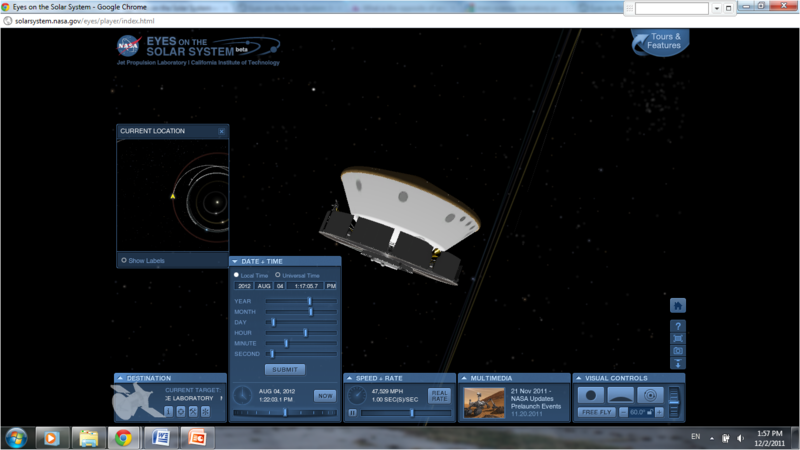 The above image shows a view of the spacecraft as it should look on August 4, 2012. To the left of the spacecraft is a small window showing its current location in the solar system (produced by clicking on the crosshairs icon on the left-most fly-up menu). 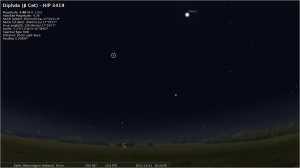 Just a note–if you’re being blinded by a regular flash of light, you’ve probably zoomed in too close to Mars. Now for the cool stuff. Got your 3D glasses ready? We’re going anaglyph. 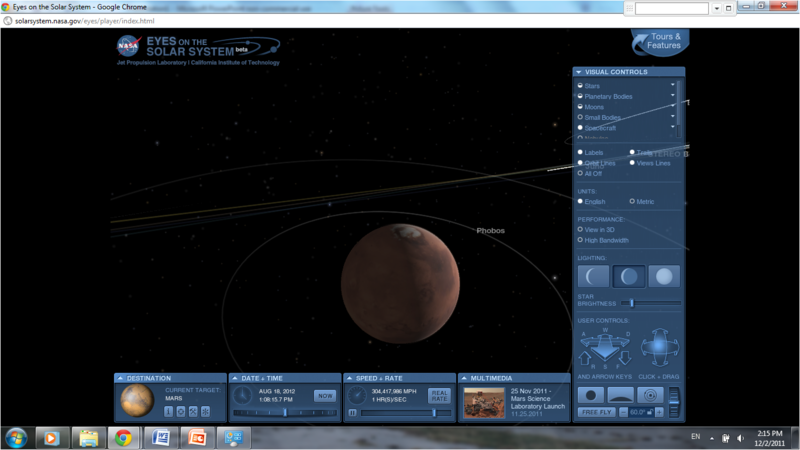 Zoom to a good view of Mars and its satellites, then click on the top bar of the VISUAL CONTROLS menu, to the right of the screen. Now, click on the “View in 3D” line under PERFORMANCE on the VISUAL CONTROLS menu. Put on your glasses and you’re good to go. You’ll just have to imagine a room full of space geeks wearing cardboard 3D glasses during our demonstration on Saturday (or you could do a web search, ’cause I’m sure the photo evidence is out there somewhere). The entrance page to the Eyes site provides links to a video introduction, which I recommend watching before you starting pointing and clicking (trust me, been there, done that, had to start over). The tutorials are even more helpful. Many thanks to the team behind Eyes on the Solar System, especially JPL Visualization Producer, Doug Ellison (@Doug_Ellison, @NASA_Eyes), who graciously demonstrated Eyes on the Solar System and Eyes on the Earth for us. And thanks to everyone at NASA and JPL for making the MSL NASATweetup happen. Thanks to you, I learned a ton, met some great people, and finally got to attend a rocket launch.